Krugman was previously a professor of economics at MIT, and later at Princeton University. He retired from Princeton in June 2015, and holds the title of professor emeritus there. He also holds the title of Centenary Professor at the London School of Economics. Krugman was President of the Eastern Economic Association in 2010, and is among the most influential economists in the world. Krugman is known in academia for his work on international economics (including trade theory and international finance), economic geography, liquidity traps, and currency crises. 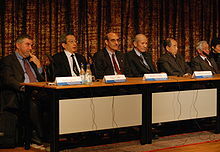 Paul Krugman, Roger Tsien, Martin Chalfie, Osamu Shimomura, Makoto Kobayashi and Toshihide Masukawa, Nobel Prize Laureates 2008, at a press conference at the Swedish Academy of Science in Stockholm. Graph illustrating Krugman's 'core-periphery' model. The horizontal axis represents costs of trade, while the vertical axis represents the share of either region in manufacturing. 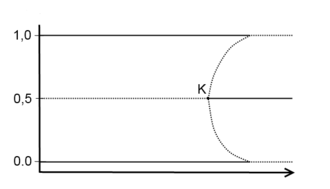 Solid lines denote stable equilibria, dashed lines denote unstable equilibria. In response to the global financial crisis of 2008, Krugman proposed, in an informal "mimeo" style of publication, an "international finance multiplier", to help explain the unexpected speed with which the global crisis had occurred. He argued that when, "highly leveraged financial institutions [HLIs], which do a lot of cross-border investment [. ... ] lose heavily in one market ... they find themselves undercapitalized, and have to sell off assets across the board. This drives down prices, putting pressure on the balance sheets of other HLIs, and so on." Such a rapid contagion had hitherto been considered unlikely because of "decoupling" in a globalized economy. He first announced that he was working on such a model on his blog, on October 5, 2008. Within days of its appearance, it was being discussed on some popular economics-oriented blogs. The note was soon being cited in papers (draft and published) by other economists, even though it had not itself been through ordinary peer review processes. From the mid-1990s onwards, Krugman wrote for Fortune (1997–99) and Slate (1996–99), and then for The Harvard Business Review, Foreign Policy, The Economist, Harper's, and Washington Monthly. In this period Krugman critiqued various positions commonly taken on economic issues from across the political spectrum, from protectionism and opposition to the World Trade Organization on the left to supply-side economics on the right. During the 1992 presidential campaign, Krugman praised Bill Clinton's economic plan in The New York Times, and Clinton's campaign used some of Krugman's work on income inequality. At the time, it was considered likely that Clinton would offer him a position in the new administration, but allegedly Krugman's volatility and outspokenness caused Clinton to look elsewhere. Krugman later said that he was "temperamentally unsuited for that kind of role. You have to be very good at people skills, biting your tongue when people say silly things." In a Fresh Dialogues interview, Krugman added, "you have to be reasonably organized ... I can move into a pristine office and within three days it will look like a grenade went off." 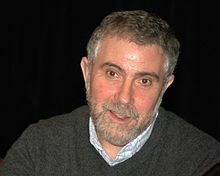 In 1999, near the height of the dot com boom, The New York Times approached Krugman to write a bi-weekly column on "the vagaries of business and economics in an age of prosperity." His first columns in 2000 addressed business and economic issues, but as the 2000 US presidential campaign progressed, Krugman increasingly focused on George W. Bush's policy proposals. According to Krugman, this was partly due to "the silence of the media – those 'liberal media' conservatives complain about ..." Krugman accused Bush of repeatedly misrepresenting his proposals, and criticized the proposals themselves. After Bush's election, and his perseverance with his proposed tax cut in the midst of the slump (which Krugman argued would do little to help the economy but substantially raise the fiscal deficit), Krugman's columns grew angrier and more focused on the administration. As Alan Blinder put it in 2002, "There's been a kind of missionary quality to his writing since then ... He's trying to stop something now, using the power of the pen." Partly as a result, Krugman's twice-weekly column on the Op-Ed page of The New York Times has made him, according to Nicholas Confessore, "the most important political columnist in America ... he is almost alone in analyzing the most important story in politics in recent years – the seamless melding of corporate, class, and political party interests at which the Bush administration excels." In an interview in late 2009, Krugman said his missionary zeal had changed in the post-Bush era and he described the Obama administration as "good guys but not as forceful as I'd like ... When I argue with them in my column this is a serious discussion. We really are in effect speaking across the transom here." Krugman says he's more effective at driving change outside the administration than inside it, "now, I'm trying to make this progressive moment in American history a success. So that's where I'm pushing." Krugman's columns have drawn criticism as well as praise. 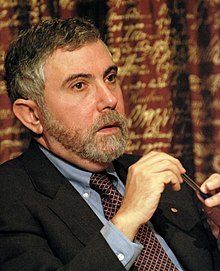 A 2003 article in The Economist questioned Krugman's "growing tendency to attribute all the world's ills to George Bush", citing critics who felt that "his relentless partisanship is getting in the way of his argument" and claiming errors of economic and political reasoning in his columns. Daniel Okrent, a former The New York Times ombudsman, in his farewell column, criticized Krugman for what he said was "the disturbing habit of shaping, slicing and selectively citing numbers in a fashion that pleases his acolytes but leaves him open to substantive assaults." Krugman's New York Times blog is "The Conscience of a Liberal", devoted largely to economics and politics. Five days after 9/11 terrorist attacks, Krugman argued in his column that calamity was "partly self-inflicted" due to transfer of responsibility for airport security from government to airlines. His column provoked an angry response and The New York Times was flooded with complaints. According to Larissa MacFarquhar of The New Yorker, while some people[who?] thought that he was too partisan to be a columnist for The New York Times, he was revered on the left. Similarly, on the 10th anniversary of the 9/11 on the United States Krugman again provoked a controversy by accusing on his New York Times blog former U.S. President George W. Bush and former New York City mayor Rudy Giuliani of rushing "to cash in on the horror" after the attacks and describing the anniversary as "an occasion for shame". Krugman was noteworthy for his fierce opposition to the 2016 presidential campaign of Bernie Sanders. On January 19, 2016, he wrote an article which criticized Bernie Sanders for his perceived lack of political realism, compared Sanders' plans for healthcare and financial reform unfavorably to those of Hillary Clinton, and cited criticisms of Sanders from other liberal policy wonks like Mike Konczal and Ezra Klein. Later, Krugman wrote an article which accused Sanders of "[going] for easy slogans over hard thinking" and attacking Hillary Clinton in a way that was "just plain dishonest". Krugman has also been critical of some of the Obama administration's economic policies. He has criticized the Obama stimulus plan as being too small and inadequate given the size of the economy and the banking rescue plan as misdirected; Krugman wrote in The New York Times: "an overwhelming majority [of the American public] believes that the government is spending too much to help large financial institutions. This suggests that the administration's money-for-nothing financial policy will eventually deplete its political capital." In particular, he considered the Obama administration's actions to prop up the US financial system in 2009 to be impractical and unduly favorable to Wall Street bankers. In anticipation of President Obama's Job Summit in December 2009, Krugman said in a Fresh Dialogues interview, "This jobs summit can't be an empty exercise ... he can't come out with a proposal for $10 or $20 Billion of stuff because people will view that as a joke. There has to be a significant job proposal ... I have in mind something like $300 Billion." Krugman's support for free trade in the 1980s–1990s provoked some ire from the anti-globalization movement. In 1987 he quipped that, "If there were an Economist's Creed, it would surely contain the affirmations 'I understand the Principle of Comparative Advantage' and 'I advocate Free Trade'." However, Krugman argues in the same article that, given the findings of New Trade Theory, "[free trade] has shifted from optimum to reasonable rule of thumb ... it can never again be asserted as the policy that economic theory tells us is always right." In the article, Krugman comes out in favor of free trade given the enormous political costs of actively engaging in strategic trade policy and because there is no clear method for a government to discover which industries will ultimately yield positive returns. He also notes that increasing returns and strategic trade theory do not disprove the underlying truth of comparative advantage. From 2016, he writes that protectionism does not cause recessions but can make economies less efficient and reduce long-term growth. Indeed, if there is a trade war, imports would decrease as much as exports, so employment would not be strongly impacted. He considers that the United States should not repeat Reagan's 1971 policy on taxes and quotas on imported products. According to him, protectionism can cause disruptions in the "value chains" and impact American workers, even if there will be no recessions. Thus, protectionism would disturb communities in the same way as free trade in the past. In addition, other countries would take retaliatory measures against US exports.He believes that the United States should not exit or change NAFTA because it would cause economic losses and disruptions to businesses, jobs, and communities. He notes that although free trade has harmed industries, communities and some workers, it is a win-win system that enriches both parties to the agreement, while a trade war is negative for all parties involved. He writes that the trade deficit does not pose a clear and immediate threat to the economy. "True, at times of high unemployment deficits can cost us jobs. But in normal times trade deficits do not reduce overall employment or impoverish us either." Moreover, according to him, tariffs and trade restrictions do not really reduce the overall trade deficit. It is not foreign exporters who pay customs duties but rather consumers. And the trade deficit would not be due to the lack of trade protection but to the lack of national savings. In 2009, contrary to what he wrote in 2016, he advised the United States to adopt protectionist measures against China. He was asking for a 25% customs duty on Chinese products. He believes that the United States should repeat Reagan's 1971 protectionist policy on imported products. Paul Krugman writes that China is pursuing a mercantilist and predatory policy, i.e. it keeps its currency undervalued to accumulate trade surpluses by using capital flow control. The Chinese government sells renminbi and buys foreign currency in order to keep the renminbi low, which gives the Chinese manufacturing sector a cost advantage over its competitors. China's surpluses are draining US demand and slowing the economic recovery in other countries with which China trades. He therefore admits that trade deficits are impoverishing the United States and represents a threat . Krugman writes: "This is the most distorted exchange rate policy a great nation has ever followed". He notes that the undervalued renmenbi is tantamount to imposing high tariffs or providing export subsidies. A cheaper currency improves employment and competitiveness because it makes imports more expensive while making domestic products more attractive. He expects Chinese surpluses to destroy 1.4 million American jobs until 2011. He proposes to take inspiration from the policy of the United States in 1971 under Reagan, i.e. the temporary taxation of certain countries' products, to force them to readjust their currencies. As a result, he is asking for a general rate of 25% on Chinese products. So, he thinks that tariffs and trade restrictions may really reduce the overall trade deficit. And the trade deficit would therefore be due to the lack of protection against China, which manipulates its currency, and not to the lack of national savings. He adds, "we currently live in a world where mercantilism works". So it is a not win-win system that enriches both parties to the agreement but rather a system where some countries get rich at the expense of others. He writes "What China is doing amounts to a seriously predatory trade policy, the kind of thing that is supposed to be prevented by the threat of sanctions"..."I say confront the issue head on". He explained that in a trade conflict, with a depressed world economy, it is the surplus countries that have a lot to lose, while the deficit countries could win, even if there are retaliatory measures and economic disruption. "Victims of this mercantilism have little to lose from a commercial confrontation. " He argue that protectionism is not a bad thing when unemployment is high or when the economic situation is not good. He quotes Paul Samuelson: "With employment less than full ... all the debunked mercantilistic arguments turn out to be valid." In addition, he supports the protectionism of other countries towards China: "Other countries are taking (modest) protectionist measures precisely because China refuses to let its currency rise. And more such measures are entirely appropriate". In 2007, he note that free trade is not good for everyone. Way back in 1941 Paul Samuelson and Wolfgang Stolper pointed out that even the most conventional economic analysis suggests that some group within a country - and possibly a large group - actually loses from trade. Krugman notes that in the free trade system, the real wages of less educated workers fall due to competition from low-cost imports. Indeed, wages fall more than import prices and the problem is aggravated because trade is increasingly with low-wage countries. In 2016, he write in contradiction with his own advice to the United States: "it’s also true that much of the elite defense of globalization is basically dishonest: false claims of inevitability, scare tactics (protectionism causes depressions! ), vastly exaggerated claims for the benefits of trade liberalization and the costs of protection, hand-waving away the large distributional effects that are what standard models actually predict. I hope, by the way, that I haven’t done any of that"..."So the elite case for ever-freer trade is largely a scam"
Finally, Paul Krugman received the Nobel Prize in 2008, for demonstrating a theory that free trade is not necessarily best . So according to him : "There is still a case for free trade as a good policy, and as a useful target in the practical world of politics, but it can never again be asserted as the policy that economic theory tells us is always right." "The strategic trade policy argument thus shows that at least under some circumstances a government, by supporting its firms in international competition, can raise national welfare at another country’s expense". Say this for Krugman: though an unabashed liberal ... he's ideologically colorblind. He savages the supply-siders of the Reagan–Bush era with the same glee as he does the 'strategic traders' of the Clinton administration. Krugman endorsed Democratic candidate Hillary Clinton in the run-up for the 2016 U.S. presidential election. According to Krugman, Gordon Brown and his party were unfairly blamed for the late-2000s financial crisis. He has also praised the former British Prime Minister, whom he described as "more impressive than any US politician" after a three-hour conversation with him. 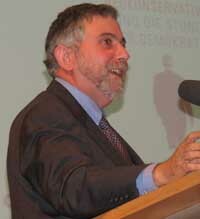 Krugman asserted that Brown "defined the character of the worldwide financial rescue effort" and urged British voters not to support the opposition Conservative Party in the 2010 General Election, arguing their Party Leader David Cameron "has had little to offer other than to raise the red flag of fiscal panic". Krugman opposed the 2003 invasion of Iraq. He wrote in his New York Times column: "What we should have learned from the Iraq debacle was that you should always be skeptical and that you should never rely on supposed authority. If you hear that ‘everyone’ supports a policy, whether it’s a war of choice or fiscal austerity, you should ask whether ‘everyone’ has been defined to exclude anyone expressing a different opinion." Krugman has been a vocal critic of Donald Trump and his administration. His criticisms have included the president's climate change proposals, the Republican tax plan and Trump's foreign policy initiatives. Krugman has often used his New York Times Op-Ed column to set out arguments against the President's policies. Krugman has been married twice. His first wife, Robin L. Bergman, is a designer. He is currently married to Robin Wells, an academic economist who received her BA from the University of Chicago and her PhD from the University of California, Berkeley. She, as did Krugman, taught at MIT. Together, Krugman and his wife have collaborated on several economics textbooks. Although rumors began to circulate in early 2007 that Krugman's "son" was working for Hillary Clinton's campaign, Krugman reiterated in his New York Times op-ed column that he and his wife are childless. (1995) (with AJ Venables) (1995). "Globalization and the inequality of nations". Quarterly Journal of Economics. 110 (4): 857–80. doi:10.2307/2946642. JSTOR 2946642. (1991) Krugman, P. R. (1991). "Target zones and exchange rate dynamics". Quarterly Journal of Economics. 106 (3): 669–82. doi:10.2307/2937922. JSTOR 2937922. ^ Krugman, Paul (May 18, 2012). "Head Still Talking". The Conscience of a Liberal. The New York Times. ^ Blodget, Henry (November 22, 2014). "Ladies And Gentlemen, We Have Finally Learned The Right Way To Say 'Krugman'!". Business Insider. ^ "Paul Krugman". Encyclopædia Britannica. June 8, 2017. ^ a b "About Paul Krugman". krugmanonline. W. W. Norton & Company. 2012. ^ "The Sveriges Riksbank Prize in Economic Sciences in Memory of Alfred Nobel 2008". nobelprize.org. ^ a b c d Nobel Prize Committee, "The Prize in Economic Sciences 2008"
^ "Lionel Robbins Memorial Lectures 2009: The Return of Depression Economics". London School of Economics, Centre for Economic Performance. June 8, 2009. ^ a b "Economist Rankings at IDEAS – Top 10% Authors, as of May 2016". Research Papers in Economics. May 2016. Retrieved July 4, 2016. ^ Note: Krugman modeled a 'preference for diversity' by assuming a CES utility function like that in A. Dixit and J. Stiglitz (1977), 'Monopolistic competition and optimal product diversity', American Economic Review 67. ^ a b Forbes, October 13, 2008, "Paul Krugman, Nobel"
^ "Columnist Biography: Paul Krugman". The New York Times. Retrieved September 14, 2016. ^ Dunham, Chris (July 14, 2009). "In Search of a Man Selling Krug". Genealogywise.com. Retrieved October 4, 2011. ^ Krugman, Paul (June 26, 2015). "Friday Night Music: Got To Admit It's Getting Better". The New York Times. Retrieved June 27, 2015. ^ The New York Times, August 6, 2009, "Up Front: Paul Krugman"
^ "Paul Krugman Biography |". ^ Paul Krugman, March 11, 2008, The New York Times blog, "Economics: the final frontier"
^ "Home – Eastern Economic Association". Eastern Economic Association. ^ Krugman, Paul (February 28, 2014), "Changes (Personal/Professional)", The New York Times, retrieved July 18, 2014, I have informed Princeton that I will be retiring at the end of next academic year, that is, in June 2015. In August 2015 I will join the faculty of the Graduate Center, City University of New York, as a professor in the Ph.D. program in economics. I will also become a distinguished scholar at the Graduate Center's Luxembourg Income Study Center. ^ Paul Krugman (December 13, 2009). "Paul Samuelson, RIP". The New York Times. One of the things Robin Wells and I did when writing our principles of economics textbook was to acquire and study a copy of the original, 1948 edition of Samuelson's textbook. ^ a b c d e f g Behrens, Kristian; Robert-Nicoud, Frédéric (2009). "Krugman's Papers in Regional Science: The 100 dollar bill on the sidewalk is gone and the 2008 Nobel Prize well-deserved". Papers in Regional Science. 88 (2): 467–89. doi:10.1111/j.1435-5957.2009.00241.x. ^ Arvind Panagariya (October 13, 2008). "Paul Krugman, Nobel". Forbes. ^ Dixit, Avinash; Stiglitz, Joseph (1977). "Monopolistic Competition and Optimum Product Diversity". American Economic Review. 67 (3): 297–308. JSTOR 1831401. ^ Kikuchi, Toru (2010). "The Dixit-Stiglitz-Krugman Trade Model: A Geometric Note". Discussion Papers from Graduate School of Economics, Kobe University (1006). ^ Rosser, J. Barkley (2011). "2: The New Economic Geography Approach". Monopolistic Competition and Optimum Product Diversity. Springer. p. 24. The workhorse model of this approach since 1991 has been the model of monopolistic competition due to Avinash Dixit and Joseph Stiglitz (1977). It was used by Paul Krugman (1979, 1980) to provide an approach to analyzing increasing returns in international trade. ^ Krugman, P. (1981). "Trade, accumulation, and uneven development". Journal of Development Economics. 8 (2): 149–61. doi:10.1016/0304-3878(81)90026-2. hdl:10419/160238. ^ Paul Krugman. http://www.ubs.com/microsites/nobel-perspectives/en/paul-krugman.html[permanent dead link] in UBS Nobel Perspectives interview, 2008. ^ "Bold strokes: a strong economic stylist wins the Nobel", The Economist, October 16, 2008. ^ "Honoring Paul Krugman" Economix blog of The New York Times, Edward Glaeser, October 13, 2008. ^ Krugman (1999) "Was it all in Ohlin?" ^ Krugman PR (2008), "Interview with the 2008 laureate in economics Paul Krugman", December 6, 2008. Stockholm, Sweden. ^ "Currency Crises". Web.mit.edu. Retrieved October 4, 2011. ^ Sarno, Lucio; Mark P. Taylor (2002). The Economics of Exchange Rates. Cambridge University Press. pp. 245–64. ISBN 978-0-521-48584-5. ^ Craig Burnside, Martin Eichenbaum, and Sergio Rebelo (2008), "Currency crisis models", New Palgrave Dictionary of Economics, 2nd ed. ^ Nayan Chanda, YaleGlobal Online, orig. from Businessworld February 8, 2008 "Decoupling Demystified"
^ "Some Observations on the Return of the Liquidity Trap" Archived September 6, 2009, at the Wayback Machine, Scott Sumner, Cato Journal, Vol. 21, No. 3 (Winter 2002). ^ Reconstructing Macroeconomics: Structuralist Proposals and Critiques of the Mainstream, Lance Taylor, Harvard University Press, p. 159: "Kregel (2000) points out that there are at least three theories of the liquidity trap in the literature – Keynes own analyses ... Hicks' [in] 1936 and 1937 ... and a view that can be attributed to Fisher in the 1930s and Paul Krugman in latter days"
^ Paul Krugman. "Paul Krugman's Japan page". Web.mit.edu. Retrieved October 4, 2011. ^ Krugman, Paul R.; Dominquez, Kathryn M.; Rogoff, Kenneth (1998). "It's Baaack: Japan's Slump and the Return of the Liquidity Trap". Brookings Papers on Economic Activity. 1998 (2): 137–205. doi:10.2307/2534694. JSTOR 2534694. ^ a b Krugman, Paul (2000), "Thinking About the Liquidity Trap", Journal of the Japanese and International Economies, v.14, no.4, Dec 2000, pp. 221–37. ^ Krugman, Paul (June 15, 2009). "Stay the Course". The New York Times. Retrieved August 15, 2009. ^ Robert Skidelsky (2009). Keynes: The Return of the Master. Allen Lane. pp. 47–50, 58. ISBN 978-1-84614-258-1. ^ Noah Smith (March 21, 2012). "Die the Krugman insurgency fail?". Brad DeLong. Retrieved May 29, 2012. ^ Henry Farrell and John Quiggin (March 2012). "Consensus, Dissensus and Economic Ideas: The Rise and Fall of Keynesianism During the Economic Crisis" (PDF). The Center for the Study of Development Strategies. Archived from the original (PDF) on August 25, 2013. Retrieved May 29, 2012. ^ Cochrane, John. "How Did Paul Krugman Get It So Wrong? ", Institute of Economic Affairs, 2011. ^ Paul Krugman and Richard Layard (June 27, 2012). "A Manifesto for Economic Sense". Retrieved July 11, 2012. ^ David Blanchflower (July 2, 2012). "David Blanchflower: Yet more nails in Osborne's economic coffin". The Independent. Retrieved July 11, 2012. ^ Katrina vanden Heuvel (July 9, 2012). "Krugman's Manifesto for Economic Common Sense". The Nation. Retrieved July 11, 2012. ^ Stephen King (chief economist HSBC) (July 9, 2012). "Krugman and Layard suffer from optimism bias". Financial Times. Retrieved July 11, 2012. ^ Catherine Rampell (October 13, 2008). "Paul Krugman Wins Economics Nobel". Economix.blogs.nytimes.com. Retrieved October 13, 2008. ^ Prize Committee of the Royal Swedish Academy of Sciences, October 13, 2008, Scientific background on the Sveriges Riksbank Prize in Economic Sciences in Memory of Alfred Nobel 2008, "Trade and Geography – Economies of Scale, Differentiated Products and Transport Costs"
^ Avinash Dixit, The Journal of Economic Perspectives, Vol. 7, No. 2 (Spring, 1993), pp. 173–88, In Honor of Paul Krugman: Winner of the John Bates Clark Medal, Retrieved March 28, 2007. ^ a b c The Economist, November 13, 2003, "Paul Krugman, one-handed economist"
^ "Adam Smith Award". Nabe.com. Archived from the original on September 27, 2011. Retrieved October 4, 2011. ^ Mother Jones: Paul Krugman Archived December 6, 2008, at the Wayback Machine., August 7, 2005. Retrieved March 28, 2007. ^ Paul Krugman Archived September 29, 2007, at the Wayback Machine, 2004. Retrieved March 28, 2007. ^ "Citation presented by Linda Bell, Associate Professor of Economics". Haverford.edu. May 28, 2004. Archived from the original on January 18, 2012. Retrieved October 4, 2011. ^ "Nobel Prize in Economics". Swedish Academy. Retrieved October 13, 2008. ^ "EPI at 25: Honoring Paul Krugman". Economic Policy Institute. November 1, 2011. Retrieved December 5, 2017. ^ "Honoris Causa a Paul Krugman" (in Portuguese). Universidade Nova de Lisboa. Archived from the original on August 18, 2012. Retrieved March 19, 2012. ^ "Paul Krugman: Doctor honoris causa by three Portuguese universities". Portuguese American Journal. February 28, 2012. Retrieved March 19, 2012. ^ "Honorary graduate Paul Krugman". University of Toronto. June 14, 2013. Retrieved June 16, 2013. ^ "Economist Professor Paul Krugman receives James Joyce Award from UCD Literary & Historical Society". University College Dublin. January 14, 2014. Retrieved January 15, 2014. ^ "Welcome Professor Krugman as the Sanjaya Lall Visiting Professor of Business and Development". Green Templeton College, Oxford. May 7, 2014. Retrieved May 7, 2014. ^ College, Green Templeton. "Home". Green Templeton College. ^ "Oxford announces honorary degrees for 2016 | University of Oxford". ^ "The FP Top 100 Global Thinkers". Foreign Policy. November 26, 2012. Archived from the original on November 28, 2012. Retrieved November 28, 2012. ^ "The Great Unraveling: Losing Our Way in the New Century". Powell's Books. Retrieved November 22, 2007. ^ a b Krugman, Paul, Rolling Stone. December 14, 2006, "The Great Wealth Transfer"
^ a b "Nobelpristagaren i ekonomi 2008: Paul Krugman", speech by Paul Krugman (Retrieved December 26, 2008) 00:43 "The title of The Conscience of a Liberal ... is a reference to a book published almost 50 years ago in the United States called The Conscience of a Conservative by Barry Goldwater. That book is often taken to be the origin, the start, of a movement that ended up dominating U.S. politics that reached its first pinnacle under Ronald Reagan and then reached its full control of the U.S. government for most of the last eight years." ^ a b c Michael Tomasky, The New York Review of Books, November 22, 2007, "The Partisan"
^ October 17, 2007 – Krugman "On Healthcare, Tax Cuts, Social Security, the Mortgage Crisis and Alan Greenspan" Archived November 13, 2007, at the Wayback Machine, in response to Alan Greenspan's September 24 appearance Archived October 9, 2007, at the Wayback Machine with Naomi Klein on Democracy Now! ^ "Paul Krugman's Prescription For A 'Depression'". NPR Books. National Public Radio. Retrieved May 9, 2012. ^ Martin Wolf (May 24, 2012). "Lunch with the FT: Paul Krugman". Financial Times. Retrieved May 29, 2012. ^ a b Neary, J. Peter (2009). "Putting the 'New' into New Trade Theory: Paul Krugman's Nobel Memorial Prize in Economics" (PDF). Scandinavian Journal of Economics. 111 (2): 217–50. doi:10.1111/j.1467-9442.2009.01562.x. ^ a b c Hirsh, Michael (March 4, 1996). "A Nobel-Bound Economist Punctures the CW – and Not a Few Big-Name Washington Egos". Newsweek. Retrieved October 13, 2008. ^ ""China the financial nexus" – Krugman". Channel4.com. Retrieved October 4, 2011. ^ a b c d e f g Confessore, Nicholas (December 2002). "Comparative Advantage". The Washington Monthly. Archived from the original on February 6, 2007. Retrieved February 5, 2007. ^ New Statesman, February 16, 2004, "NS Profile – Paul Krugman"
^ "Fresh Dialogues interview with Alison van Diggelen, November 2009". Freshdialogues.com. December 9, 2009. Retrieved October 4, 2011. ^ a b "Fresh Dialogues interview with Alison van Diggelen". Freshdialogues.com. December 9, 2009. Retrieved October 4, 2011. ^ (unattributed) (November 2003). "The one-handed economist". The Economist. ^ Okrent, Daniel (May 22, 2005). "13 Things I Meant to Write About but Never Did". The New York Times. Retrieved August 16, 2009. ^ a b c Evan Thomas, Newsweek, April 6, 2009, "Obama's Nobel Headache"
^ Larissa MacFarquhar (March 1, 2010). "The Deflationist: How Paul Krugman found politics". The New Yorker. Retrieved October 5, 2011. ^ Paul Krugman (September 16, 2001). "Reckonings; Paying the Price". The Conscience of a Liberal. Retrieved October 5, 2011. ^ Paul Krugman (September 11, 2011). "The Years of Shame". The Conscience of a Liberal. Retrieved October 5, 2011. ^ Tim Mak (September 13, 2011). "Paul Krugman defenders attacked by conservative bloggers". The Politico. Retrieved October 5, 2011. ^ Paul Krugman (January 19, 2016). "Weakened at Bernie's". The Conscience of a Liberal. Retrieved April 21, 2017. ^ Paul Krugman (April 8, 2016). "Sanders Over the Edge". Retrieved April 21, 2017. ^ "Leprechaun Economics and Neo-Lafferism". New York Times. November 8, 2017. ^ "Leprechauns of Eastern Europe". New York Times. December 4, 2017. ^ "The U.S. Has a 'Leprechaun Economy' Effect, Too". Bloomberg. July 19, 2017. ^ "Housing data reveals return of 'leprechaun economics'". Irish Times. April 21, 2017. ^ Paul Krugman (February 10, 2017). "When the Fire Comes". The New York Times. Arthur Ochs Sulzberger Jr. Retrieved February 13, 2017. ^ Krugman, Paul (December 1994). "The Myth of Asia's Miracle". Foreign Affairs. Archived from the original on October 16, 2008. Retrieved December 26, 2008. ^ Van Den Berg, Hendrik; Joshua J. Lewer (2006). International Trade and Economic Growth. M.E. Sharpe. pp. 98–105. ISBN 978-0-7656-1803-0. ^ Krugman, Paul (September 7, 1998). "Saving Asia: It's Time To Get Radical The IMF plan not only has failed to revive Asia's troubled economies but has worsened the situation. It's now time for some painful medicine". Fortune. Retrieved July 12, 2009. ^ Landler, Mark (September 4, 1999). "Malaysia Wins Its Economic Gamble". The New York Times. Retrieved July 15, 2009. ^ Kaplan, Ethan; Dani Rodrik (February 2001). "Did the Malaysian Capital Controls Work?". NBER Working Paper (8142). doi:10.3386/w8142. ^ Krugman, Paul (March 4, 2010). "Malaysian Memories". The New York Times. Retrieved March 11, 2010. ^ Krugman, Paul (December 4, 2012). "The IMF and Capital Controls". The New York Times. Retrieved December 5, 2012. ^ Krugman, Paul (March 21, 2003). "Who Lost the U.S. Budget?". The New York Times. Archived from the original on July 25, 2009. Retrieved June 24, 2009. ^ Dana, Will (March 23, 2003). "Voodoo Economics". Rolling Stone. Retrieved August 1, 2009. ^ Lehrke, Dylan Lee (October 9, 2003). "Krugman blasts Bush". The Daily of the University of Washington. Archived from the original on October 9, 2009. Retrieved August 1, 2009. ^ a b Krugman, Paul (October 7, 2001). "Fuzzy Math Returns". The New York Times. Retrieved August 1, 2009. ^ Krugman, Paul (May 21, 2016). "Paul Krugman Commencement Speech?". Archived from the original on June 23, 2016. Retrieved May 31, 2016. ^ Krugman, Paul (August 29, 2005). "Greenspan and the Bubble". The New York Times. Retrieved December 7, 2008. ^ Krugman, Paul (March 24, 2008). "Financial Crisis Should Be at Center of Election Debate". Spiegel Online. Retrieved July 9, 2009. ^ Krugman, Paul (March 24, 2008). "Taming the Beast". The New York Times. Retrieved July 9, 2009. ^ Krugman, Paul (March 29, 2008). "The Gramm connection". The New York Times. Retrieved June 24, 2009. ^ Lerer, Lisa (March 28, 2008). "McCain guru linked to subprime crisis". Politico. Retrieved June 24, 2009. ^ Paul Krugman. "Behind the Curve". The New York Times. March 9, 2009. ^ "Fresh Dialogues interview with Alison van Diggelen, November 2009". Freshdialogues.com. November 13, 2009. Retrieved October 4, 2011. ^ Paul Krugman (March 15, 2010). "Taking on China". The New York Times Company. Retrieved March 22, 2010. ^ Jeremy Warner (March 19, 2010). "Paul Krugman, the Nobel prize winner who threatens the world". London: The Daily Telegraph. Retrieved March 22, 2010. ^ Krugman, Paul (April 23, 2010). "Don't cry for Wall Street". The New York Times. Retrieved April 27, 2010. ^ Shleifer, Andrei; Vishny, Robert; Gennaioli, Nicola (April 12, 2010). "Financial Innovation and Financial Fragility" (PDF). Archived from the original (PDF) on May 6, 2010. Retrieved April 27, 2010. ^ Krugman, Paul (June 28, 2010). "The Third Depression". The New York Times. Retrieved March 9, 2012. ^ "Why We're in a New Gilded Age by Paul Krugman". nybooks.com. May 8, 2014. ^ Krugman, Paul (October 16, 2009). "Samuel Brittan's recipe for recovery". The New York Times. ^ Krugman, Paul (July 29, 2009). "The lessons of 1979–82". The New York Times. ^ Krugman, Paul (September 23, 2009). "The freshwater backlash (boring)". The New York Times. ^ a b Krugman, Paul. (2009-9-2). "How Did Economists Get It So Wrong?". The New York Times. Retrieved October 9, 2009. ^ Krugman, Paul (August 30, 2011). "Who You Gonna Bet On, Yet Again (Somewhat Wonkish)". Conscience of a Liberal (blog). The New York Times. Retrieved November 18, 2011. ^ Krugman, Paul. "There's something about macro". MIT. Retrieved November 18, 2011. ^ Krugman, Paul (June 21, 2011). "Mr. Keynes and the Moderns" (PDF). VOX (originally for Cambridge conference commemorating the 75th anniversary of the publication of The General Theory of Employment, Interest, and Money). Retrieved November 18, 2011. ^ Krugman, Paul (May 19, 2009). Actually existing Minsky. The New York Times. ^ Rezende, Felipe C. (August 18, 2009). "Keynes's Relevance and Krugman's Economics". Archived from the original on November 4, 2017. Retrieved December 9, 2018. ^ Conceicao, Daniel Negreiros (July 19, 2009). "Krugman's New Cross Confirms It: Job Guarantee Policies Are Needed as Macroeconomic Stabilizers". Archived from the original on August 26, 2017. Retrieved December 9, 2018. ^ Mitchell, Bill (July 18, 2009). "Nobel prize winner sounding a trifle modern moneyish". ^ Eggertsson, Gauti B.; Krugman, Paul (June 14, 2012). "Debt, Deleveraging, and the Liquidity Trap: A Fisher-Minsky-Koo Approach" (PDF). Quarterly Journal of Economics. 127 (3): 1469–513. doi:10.1093/qje/qjs023. ^ Dale, Leigh; Gilbert, Helen (2007). Economies of representation, 1790–2000: colonialism and commerce. Ashgate Publishing, Ltd. pp. 200–01. ISBN 978-0-7546-6257-0. "[Krugman and Obstfeld] seem to want to shame students into believing that there are no well-grounded arguments against coercing poor countries into free trade. ... This is poor logic, and pernicious insensitivity." ^ a b "Ricardo's difficult idea". Web.mit.edu. 1996. Retrieved October 4, 2011. ^ Glasbeek, H. J. (2002). Wealth by stealth: corporate crime, corporate law, and the perversion of democracy. Between The Lines. p. 258. ISBN 978-1-896357-41-6. "As E.P. Thompson once noted, there are always willing experts and opinion leaders, such as Friedman and Krugman, to give a patina of legitimacy to the claims of the powerful [with their] ill-concealed cheer-leading . ... "
^ Dev Gupta, Satya (1997). The political economy of globalization. Springer. p. 61. ISBN 978-0-7923-9903-2. ^ Krugman, Paul R. (1987). "Is Free Trade Passe?". The Journal of Economic Perspectives. 1 (2): 131–44. doi:10.1257/jep.1.2.131. JSTOR 1942985. ^ Paul Krugman (May 22, 2015). "Trade and Trust". The New York Times. Retrieved June 15, 2015. ^ Paul Krugman (August 14, 2011). "The Texas Unmiracle". The New York Times. ^ Kaufman, S. Salon July 9, 2016. ^ Krugman, Paul (November 19, 2007). "Republicans and Race". The New York Times. ^ Krugman, Paul (August 7, 2009). "The Town Hall Mob". The New York Times. ^ Amponsah, William (December 3, 2007). "The Conscience of a Liberal: Book Review". Savannah Daily News. ^ Parini, Jay (March 22, 2008). "Review: The Conscience of a Liberal". The Guardian. ^ a b Krugman, Paul (June 7, 2009). "Gordon the Unlucky". The New York Times. ^ Sparrow, Andrew (December 24, 2010). "Thirty new facts about Gordon Brown from Anthony Seldon's book". The Guardian. ^ Krugman, Paul (October 12, 2008). "Gordon Does Good". The New York Times. ^ "Why Was Paul Krugman So Wrong?". The Nation. April 1, 2013. ^ Krugman, Paul (September 29, 2017). "Trump's Deadly Narcissism". The New York Times. Retrieved December 12, 2017. ^ "Robin Wells". Macmillan Learning. Retrieved November 22, 2017. ^ Krugman, Paul (December 19, 2007). "About my son (blog post)". The New York Times. ^ MacFarquhar, Larissa (March 1, 2010). "THE DEFLATIONIST: How Paul Krugman found politics". The New Yorker. ^ Krugman, Paul (January 10, 2003). "Your questions answered". Blog archive. Retrieved December 19, 2007. ^ Krugman, Paul (November 30, 2015). "Inequality and the City". The New York Times. ^ a b Krugman, Paul (February 28, 2014). "Changes (Personal/Professional) (blog post)". The New York Times. ^ "Noted Economist Paul Krugman to Join Graduate Center Faculty in 2015" (Press release). The Graduate Center, CUNY. February 28, 2014. ^ Krugman, Paul (March 25, 2010). "David Frum, AEI, Heritage And Health Care (blog post)". The New York Times. ^ Clark, Andrew (May 28, 2011). "Paul Krugman: liberal loner who thinks Obama is spineless and Gordon Brown saved the world". The Guardian.